Earlier this year, Mariemae Stationary and Mariemae Business School founder Jillian Ryan partnered with No. 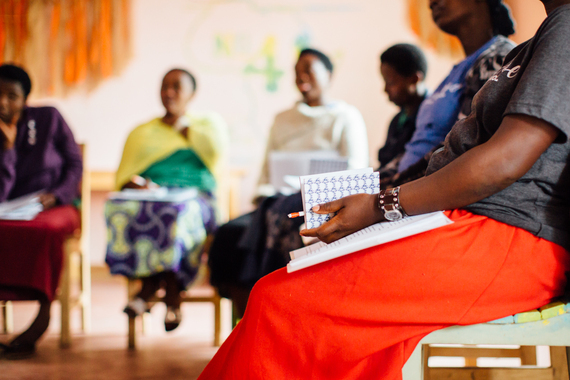 41, a Rwanda-based social enterprise, to offer business training to the organization. No. 41 employs 21 women from the Noel Orphanage and the surrounding area in the small village of Gisenyi. Not only does No. 41 provide sustainable employment, their bag sales help provide funding for local children's education and school meals. 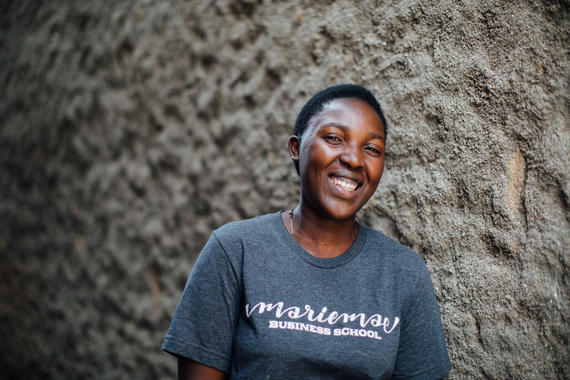 Mariemae's business plan calls for one purchase to equal one hour--for every purchase of Mariemae stationary, which was founded to create well-designed office supplies and be a force for good, an hour of business training is allotted to a woman entrepreneur in a developing market. Marimae's goods are themselves a testimony to global artisans. Each notebook, card, and pouch is adorned with designs created by women around the world. In Jillian's view, purchase and partnership go hand in hand. Here are few snapshots of the women Jillian has encountered through her work for Mariemae and with No. 41. Today in Gisenyi, Rwanda women eager to learn line up for training at the Mariemae Business School. Some of the women, like Lydia, are just starting out--she recently celebrated her second week on staff. Lydia joined the team after her husband, Gilbert, began working on leather designs for the organization. She is already a well-trained seamstress and is excited to learn more. For others, like Xavera, business school is a means of reinforcing existing skills. Already a seasoned businesswoman, Xavera uses the money she makes at No.41 to invest in small projects that help her pay for her children's school fees. In the classroom, Xavera is bursting with ideas. She takes notes, speaks up when called upon, and assuredly pitches the product she hopes to sell someday during her presentation exercise. Xavera feels confident that she will be able to continue to expand her skills and become an independent businesswoman. "Mariemae Business school taught me to find my own market," she says. Soon, Xavera plans to collaborate with her No. 41 coworkers and approach local school leaders with a business plan to produce school uniforms for the next academic year. Her drive stems from her deep desire to see her three children receive an education and succeed in their careers. "The first thing being an entrepreneur would help me with is to train my children about this job," she says. Lydia also hopes to own her own business someday. During her training, Jillian assisted Lydia in creating a business plan. This was a chance for Lydia to call something her own, as well as lay a foundation for her family's future. She is expecting her first child with Gilbert, and they hope to save enough money to buy a gate for their home to provide security for their newborn child. The business will not only help provide safety for their house but also the safety that comes from financial independence. "As my baby grows," Lydia says, "if I had an account for them, they wouldn't need anything." The relationship is reciprocal, too. Working with No. 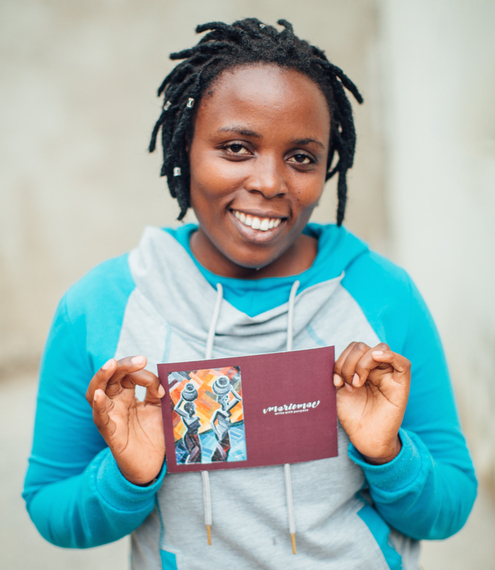 41 helped Mariemae find a new kind of partnership--a designer to help with its stationary prints. Clarisse grew up in Gisenyi. She was just four years old when she lost her parents in the 1994 Rwandan Genocide. Although she misses her family, she is determined to remain optimistic. "I want to show Rwandans and other people that they should not lose their culture," she says. "We need to keep the good things." Drawing inspiration from the vibrancy of the women in her community, Clarisse wants her artwork to reflect the beauty of her homeland. She began honing her creative talents in 2012 when she joined No. 41. During her first year, she learned painting on bags and sewing patterns as well as management skills. Her love of graphic design, which had begun in secondary school, quickly grew into a career. Now, Clarisse is pursuing a degree in Business Information Technology at the local university. She has completed several paintings on commission and her bold and innovative work for Mariemae has allowed her to support herself while she's in school. 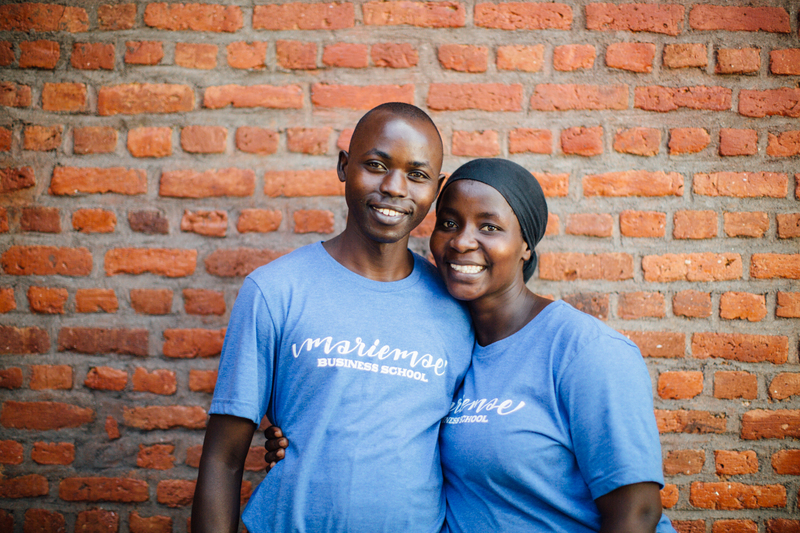 She is perpetuating Mariemae's mission to create good work while doing good. "I am so happy to help women and Africans around the world," she says. "I want to help people through what I've learned about designing." Learn more about Mariemae here.